It's not all nice things like drinking, falling over and snogging at Glastonbury. Nasty things like rancid, urine-sodden, mud-caked food and poor quality jugglers enter the lives of the (not so) rich and (moderately) famous, too. Here, a few of them tell Angela Lewis their best and worse Glasto experiences. 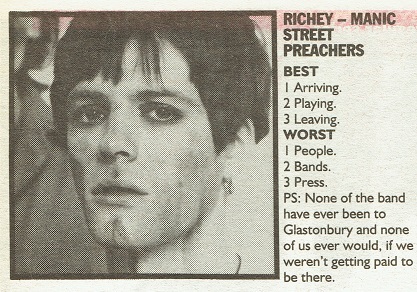 PS: None of the band have ever been to Glastonbury and none of us ever would, if we weren't getting paid to be there. This page was last modified on 15 May 2018, at 05:30.